Featured photo: Single malt Scotch for a post from a single guy’s perspective. The older you get, the more complicated and nuanced life becomes. Now that I’m in my prime, there are types of relationships with one another that I find become more difficult to start, build, maintain, or even understand. Many of us know or learn through experience that friendships are easier to make (and walk away from) in our younger years. Often little thought or premeditated plans are put into them. It can start with the most basic of event based coincidences like being at the same playground or being put on the same dodgeball team during gym class. From there, the smallest of sparks ignites a new friendship just like that! And for the most part, these sorts of situational-based sparked friendships are still made throughout college. As an adult, you wonder why we make it harder on ourselves. We know friendships will change. But oh how we nostalgically look back at the simpler days! Many of our friendships are forged in the midst of being in the same place at the same time, frequently revolving around our age or place in life especially during the high school through our mid-20s. We do life together as we figure it all out in a collective confusion. These shared times and spaces create experiences that come to shape and define who we are and memories we hold onto and remember quite vividly. Major life events are called that for a reason. They ripple through and touch every element of yourself, your family, and social circles. They look safe enough on the surface. Right after graduation, Will gets a job offer on the other side of the country which means you only see him during holidays. Jimmy got into that masters program which means evening classes and less time to hangout. Bobby joins a sports league which infuses your core social group with new and fun faces. Jenny starts dating Brad and as they get more serious you start calling them “Benny” or “Jed”. These choices and life moments change you, even when you’re not the one going through them. It’s always interesting to think about the impact the decisions others make affect us. Of those events, one of the biggest is when you or your friends find significant others. Hanging out starts to feel… different. What you talk about when you’re all together starts to change. You hear the occasional “we” instead of the “I” when one of them speaks. Depending on the couple, the conversations turn to “let me see if he/she is free too” even though you were only inviting one of them. Oops. Then dating turns to marriage. The wedding and reception day come and it’s a wonderful celebration for all. A new union is very much worth having a big party for! No matter what anyone may try to do to avoid the inevitable, those relationships take a drastic shift and will look and feel very different. There is no avoiding the winds of change. So what do you do when life trajectories aren’t on the same path anymore and you stop sharing some common goals, interests, and perhaps most importantly, free time? There’s a number of challenges along the way for which I have found no straightforward answer yet. How do you deal with not being as close to your best friend as you once may have been? What’s an appropriate friendship level with your friend’s spouse who you didn’t know as well before they were married? How do you handle the logistics and nuances of married friends with kids? More questions and thoughts coming soon! Feedback and response again is welcome, whether in the comments section or privately. If there’s one thing we’ve become exceedingly great at in American culture, it’s criticizing everything. Whether it’s what celebrities wear, or what someone posts on Twitter or Facebook, “romantic” decisions made on reality dating shows, how well or poorly we perceive that coworker to be doing her job, or pretty much anyone’s life decisions. We love and aspire to “drag” people online like it’s a sport and follow those who are amazing at it. It’s all about that ultimate burn, calling someone out on anything you’re outraged about or against in any capacity, getting the final word in and “winning.” But the question is, what is it we’re all winning? Superiority – or at least the illusion of it. Often times I need to take a step back from everything and ask myself, “is there an overarching theme or pattern happening in my life?” It’s fascinating to see how various facets of my life are intertwined usually to teach me – and maybe the world – something. That current “something” is that we don’t know everything. We think we do so often, assume a bit too much, and because of that often miss something critical. We must ask more questions. It is a significant step to understanding of all manners of things, especially ourselves. At work, I try to teach and encourage those on my team and around the company to not take anything at face value. Too often someone takes a task or project request and runs with it. At surface level, everything seems straightforward. But peel back even one layer and finding out the “why” that is driving that request and you learn that on-the-surface craziness has some context and reasoning you can support – or at least acknowledge. Or you ask your client to expand on an idea and all of a sudden a great idea is sparked to take the project to a new level or a future potential issue is avoided. In relationships, questions are the basis for learning more about other people. You know what everyone’s favorite topic is? What they know best of course: themselves. In my life, I have had many conversations with people without uttering much beyond my name, where I’m from or live, and a gloss over of what I do. How? By continually asking questions about just about anything they want to talk about. I’m amazed by how much others like hearing their own voice. I tap into this by keeping the focus on the other person with questions crafted and carefully selected for them. When I’m not in the mood to talk about myself, it’s a powerful deflection tactic that works on at least 80% of people I talk to (a couple close friends are on to me.) The only problem? When I do want to share something about my life, people still like to talk about themselves even when I’m not asking them anything. This cumulatively results in only one person feeling like they are known better; often times that person is not me. It can lead to a sense of isolation or not feeling cared about. When it comes to ourselves, how often are we asking the really tough questions in a way that results in action or real insight? The right questions can be uncomfortable to respond to. Why? Do we not ask them because we don’t care about other people or about ourselves? Or is it because we’re afraid someone will ask us about stuff we don’t want to talk about? Maybe it’s why I direct a lot of conversation focus back to other people. One of the worst things we do is assume we know everything we need to know from work to friendships. Without questions, we are left to assume what we don’t know, and Assuming takes you to dangerous places. So don’t be too taken aback if I ask lots of questions. It means I care and I don’t want to miss something along the way. It took four months of training and Saturdays where I didn’t sleep in until noon and many other nights during the week skipping out on TV, laying on the couch, or hanging out with friends over a beer or other tasty beverage. 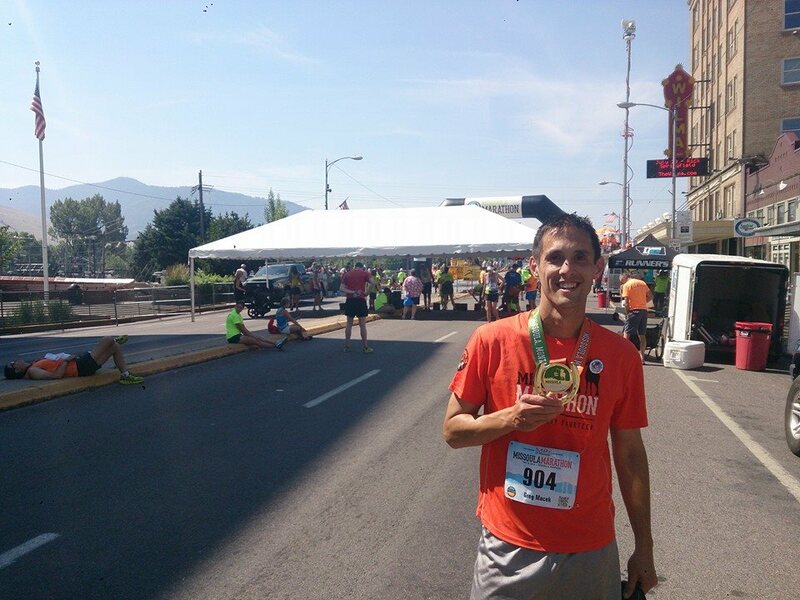 It all led up to one Sunday morning in Montana and a 26.2 mile route ahead of me. The Missoula Marathon had finally arrived. But there was so much more than just those 5+ hours to share. I could write about the time in Montana before, during, and after the race. I could share about Troy, the guy at “The Hub” who told us about so many great things to do around the area; about Doug, the guy who took us via boat and led our expedition across Flathead Lake over to Wild Horse Island and dropped knowledge and factoids like sick beats; and then there were the various events and friendly faces around Missoula that made our time there magical. Training stretches you beyond your limits (almost) without you noticing. It’s hard to believe that before March of this year, the longest I had ever run was 5 miles and that by July I considered that a “short” mid-week run. The small incremental jumps in distance in each week trained my body to take on a little more, mostly in chunks it could handle. Training is MUCH better with others. I don’t know if I could have done this without others, especially for the weekly long runs. Even without many words, the encouragement of having a friend or two by your side does wonders for your ability to continue going. Big goals require a lot more change in your life than you plan for. By far the biggest noticeable adjustment for me was not sleeping in on Saturdays. For anyone who knows me, Saturday morning is not a time you assume I’m awake or available for anything. Waking up as early as 5AM once to get my training run in took me way outside my comfort zone. The body and mind is capable of far more than we normally give it credit for. Growing up and living with asthma, running long distances never seemed to be something attainable to me. In the last few years I seem to have mostly grown out of it, however, and it allowed me to complete a marathon. With this achievement under my belt, I look ahead to what else I can do. Perhaps it will be another marathon to push for a faster time, or to improve and increase my writing abilities, or to actually learn how to fix more stuff around the house. At the expense of sounding cheesy, “if you put your mind to it, you can accomplish anything.” (Marty McFly, Back to the Future). I don’t know about you, the reader, but I grow more concerned and fearful every day that our culture is falling deeper into this trap of wanting more “wow factor” out of just about everything we experience. And of course, these experiences cannot come from a longer drawn out process. No, they must be instant, emotionally touching (but only positive), and promise to change how you view the world. This has become a noteworthy characteristic of places like Upworthy and similar viral content focused sites. Social media sharing has primarily become about the feel good moment. However, leave it to news outlets to pick up the slack on the other end of the spectrum. We all know by now how the news (perhaps a misused term these days) use outlandish titles and exaggerated terminology to describe just about everything to keep us hooked in. This is nothing new and has been a tactic used for decades. Social media, and us as creators of most of that media, have fallen right into the same patterns that has made us hate the news and write that way in status updates. We even do it in our day to day conversation. Our stories must be dramatic, “epic”, “amazeballs”, or whatever other terms are in now. (I’m clearly showing some age now.) It hasn’t helped that we’ve been telling our kids and each other we’re all “different and unique” in our own special ways. So now we all think we have some great story to tell – and really some of us do. I have wondered before how the Internet and social media channels have increased our narcissism or simply given us an outlet for what was always there. And thanks to Facebook, we all have a mini montage of our lives with a emotion-inducing soundtrack to watch and share in case you weren’t there the first when you posted all of it. I’m waiting to see the day when this one-upping of everything bubble will burst like the early 2000’s tech bubble or the mid 2000’s housing bubble. This can’t go on for much longer without it imploding. In ways, I look forward to seeing where we can do next. Perhaps it’ll be a world where solid content speaks for itself and we can analyze and identify it for what it truly is instead of being told it’s the best thing we’ve ever read. No seriously – THE BEST.